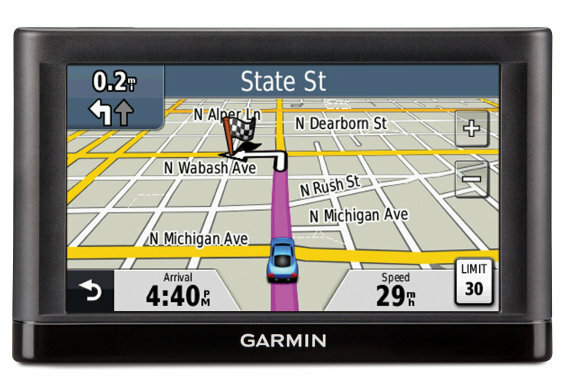 The Garmin nuvi 52 is one of the company’s 2013 Essential series models, their entry-level line. Even so, it includes many features that were relegated to high-end models not that long ago — speed limit display, junction view and lane assist. 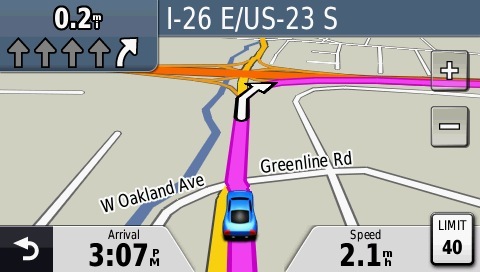 The nuvi 52 is great choice for someone who needs a basic navigator without all the bells and whistles. It’s got an extra-large 5″ display and comes with preloaded maps of the entire US except Alaska. NOTE: Much of the following is adapted from my hands on review of the nuvi 52LM, which is idemtical except that it adds lifetime map updates. There’s not a whole lot new on the nuvi 52 compared to the previous generation 50LM. I did notice a snappier response though, so it’s quite possible they’ve beefed up the processor a bit. There are many other features found on the Advanced and Prestige series, but these are some of the more basic ones. The remaining differences are covered in my reviews of those models. You can shift the data fields to the right and get two additional fields by selecting Settings > Map (scroll down) > Map Data Layout > More Data. This feature shows you which lane to be in for upcoming turns, as shown below in the upper left portion of the image below. This split screen view pops up for many limited access highway exits. Note that the junction view images are generic and not the photo-realistic ones found on more advanced models. Highly recommended. The only trouble I had with my test unit was that it wouldn’t connect to the computer once. But after I used it in the car, I was able to bring it in and connect it with no problem. This is a basic navigator but it has all the features most people will need. An improved mounting system and faster processor mark the most significant updates since the nuvi 50. I’ll be posting links to other reviews as they show up. how do i speedup connection when loading an address?